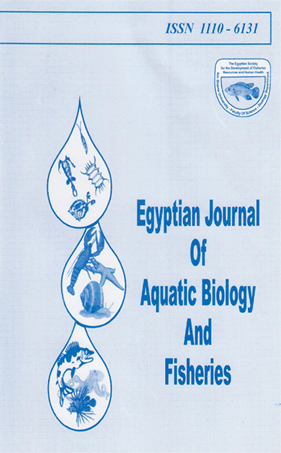 1Fish Physiology Laboratory, Fisheries Division, National Institute of Oceanography and Fisheries (NIOF), Ministry of Scientific Research, Alexandria, Egypt. 2Fish Nutrition Lab., Aquaculture Division, NIOF, Alexandria, Egypt. 3Marine Microbiology Lab., Marine Environment Division, NIOF, Alexandria, Egypt. The present study addressed to investigate early, 25 days post hatching (dph) and late co-feeding time; 35 dph on European seabass (Dicentrarchus labrax) larvae. Initially, larvae were reared from the 5thdph in six glass aquaria, and each aquarium contained 200 larvae.The results revealed higher, but no significant (P > 0.05) effect on larval final weight, weight gain, average daily gain and specific growth rate when larvae were co-feed at 35 dph. However, the highest survival rate was noticed then larvae were co-fed from 25 dph. Growth parameters showed significant (P < 0.05) effect on final gainsof both total and standard lengthswhen larvae were started co-feeding at 25 dph. The water quality showed no significant (P > 0.05) differences between treatments. However, significant (P < 0.05) effect was revealed on total culturable bacteria - and bacilli counts in water samples at 45 dph,when larvae were co-fed at 25 dph, but no significant (P > 0.05) effect was noticed on Staphylococcus counts at 45dph of larvae co-fed from 35 dph. Digestive enzymes analysis revealed that lipase activity was not significantly (P > 0.05) affected, however, a significant (P < 0.05) increase in amylase activity was revealed when larvae co-fed at 35 dph.